Built in 1860, our clients traditional Victorian home has been lovingly restored over the last 20 years and still retains many of its original features. One feature that was causing a problem was the original door which was unable to open more than a 1/3rd of its available width due to settlement over the years, which had caused it to catch on the tiled floor and let in drafts through the winter months. 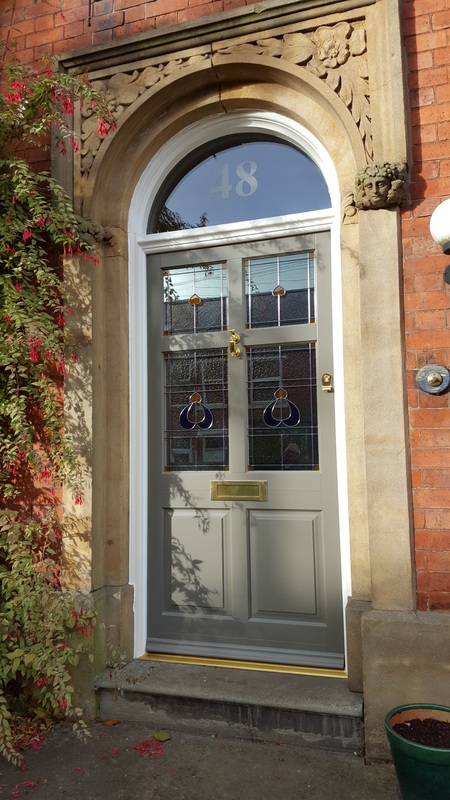 Keen not to lose the character of their home, our clients considered their new door design carefully before selecting the Frenchay door design in a soft Quartz Grey (RAL 7039) with Classic Stained Glass detail. Installation included the removal and replacement of internal timber shutters which surrounded the door to allow the installation to be completed. After using Prestige Window Systems for 4 previous phases of Sliding Sash window replacement our client felt comfortable to trust us with the main focus of his home. We hope you’ll agree, the final result is stunning and we’re very proud of the work our guys have completed.